Crux Ansata means ‘handled cross’ and is another name for the Egyptian Ankh. There are a lot of pop culture meanings assigned to the ankh, and this particular version with the more standard cross buried inside is one often associated with the Goth subculture and vampires in particular. This print was created by layering print after print, running the paper through the press several times and then finally painting with ink directly onto the page. First a sheet of handmade paper was used to create the swirling blue-green background texture. 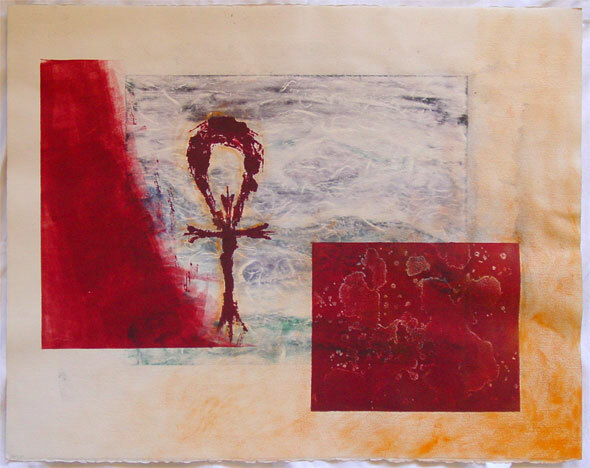 Then the ankh itself was applied as a monoprint but using the thicker oil-based etching inks, which were also used to ink the red found-object etching plate with its deeply etched random splatters. The other field of red is also a monoprint, which means this page went through the printing press 4 times total. Finally, the gold etching ink that glows in the lower right-hand corner and limns the ankh itself was applied by hand directly to the paper with a paintbrush. The whole piece is quite large, on a thick sheet of watercolor paper. 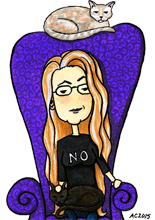 It’s 30″x22″, or 2.5 feet wide and nearly 2 feet tall. The first layer of blue-green-grey swirls always reminds me of some sort of spirit, and the glow of golden yellow in the corner and around the ankh the life-energy that the ankh is often thought to symbolize. Blood red anchors the piece in the flesh and gives the whole thing a Gothic edge, though the overall effect is hopeful. Crux Ansata, 30″x22″ monoprint on watercolor paper, $699 with free shipping.